The dry stone walls of Grianán of Aileach. Walking towards the ancient round fort I’ve visited so many times before, I somehow feel different. A new appreciation for the site and surrounds in my old age makes me see the place in a whole new light. 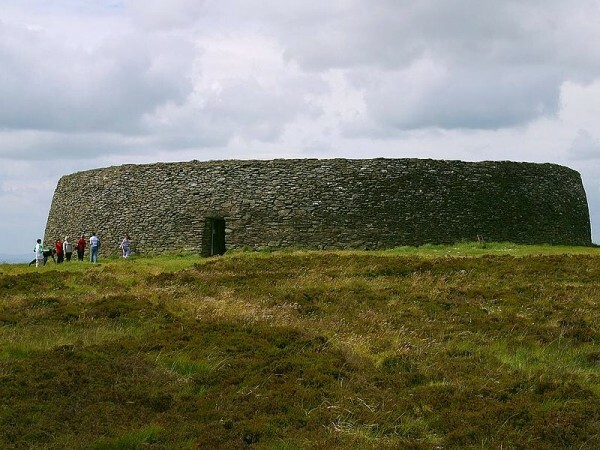 Grianán of Aileach (Fortress of the Sun) is a wonderful sixth century stone fort, which sits atop a 244 metre high hill in Burt, Co. Donegal, about 11 kms from my hometown of Derry, or Derry~Londonderry, as it’s been recently christened by the media. 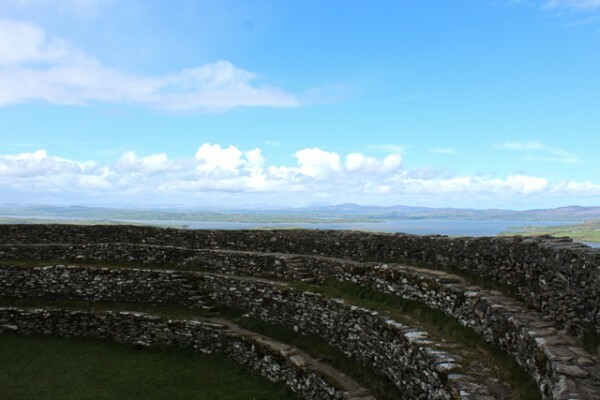 Grianan of Aileach: Fortress of the Sun. The origins of this National Monument date back to 1700 BCE, and is said to be a burial monument to one of the earliest invading King’s sons, though this is just one of a few theories. 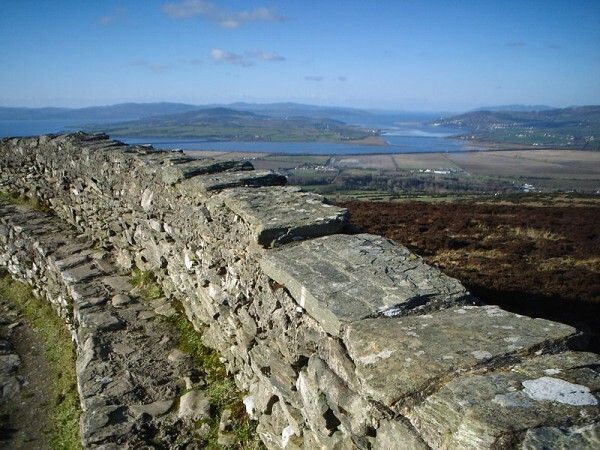 The 4.5 meter thick walls stand 5 meters high and offer panoramic views over the Innishowen Peninsula, Lough Swilly, Lough Foyle and across northern and southern Ireland. It is one of the royal sites of Gaelic Ireland, and was once the seat of the Kingdom of Ireland. Through the centuries it has been witness to many a battle, and in 1101 was almost completely destroyed by the King of Munster. 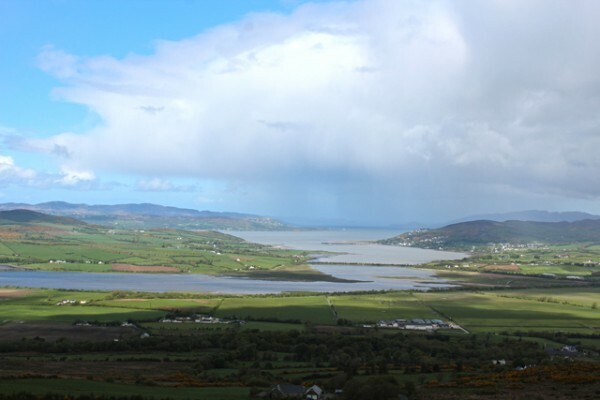 Great view towards Innishowen and Buncrana, with a massive rain cloud doing its thing. It was left untouched and ignored for many years, until 1874 when an antiquarian from Derry, Dr Walter Bernard, took it upon himself to restore the ruin. During subsequent restoration projects archaeologists discovered evidence of Bronze Age and Iron Age ramparts below the remains of the fort. 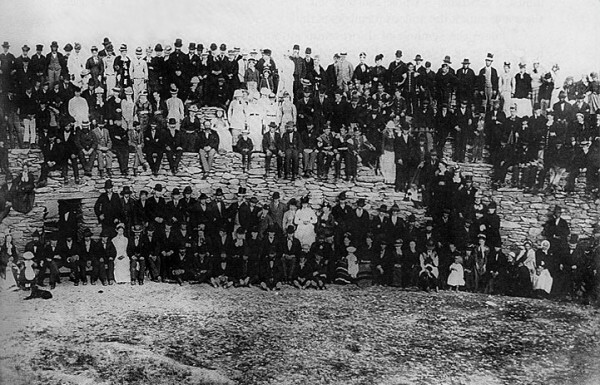 The official re-opening of Grianan Aileach in 1878 following the reconstruction of Dr. Walter Bernard. Original photo belongs to Bigger/McDonald Collection. This historical fort was my escape as an angst-ridden teenager. I would sit with my legs dangling over the edge of the wall, blindly staring out across Ireland in all directions, but in my introspection and egotism see nothing. Now, with an older head on my shoulders and wonderful life experiences under my belt, I am so happy to revisit my fortress of solace and be in a good, happy, fulfilled place. The stone walls of Grianán of Aileach, looking towards Muckish Mountain, near Creeshlough, Co. Donegal – where my family go way back. For perhaps the first time, I realise I can see so much of my own history spread out before me. 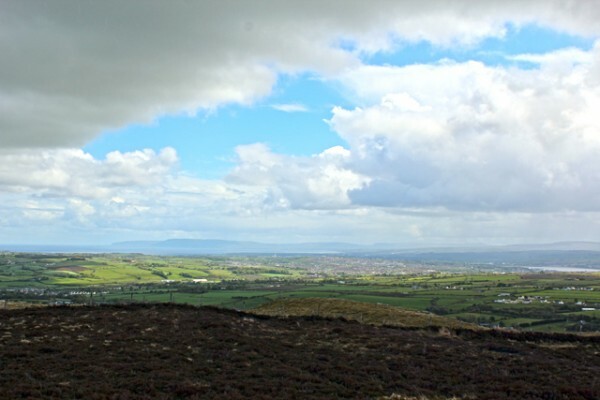 I may not be of royal stock, far from it, but from the top of the Grianán I could see my hometown in front of me and Muckish Mountain and surrounds – where my maternal side of the family hail – behind me. A huge pang of homesickness in the pit of my stomach surprised me. I felt more connected than ever before to this amazing historical site, yet in a few short days I have to leave Ireland and head back to my adopted Australian home. Looking towards Derry~Londonderry, and across to the Causeway Coast. If it wasn’t so bitterly cold on top of my world, and my own little clan weren’t screaming, “I’m freezing!” at me, I would linger for a while longer. When you spend so much of your life moving from one country to another it’s hard to feel like you belong to any one place, but right here, right now I feel completely at ease with my place in the world. Completely at home. Linda hails from evergreen Northern Ireland, but is currently living in Melbourne, Australia. 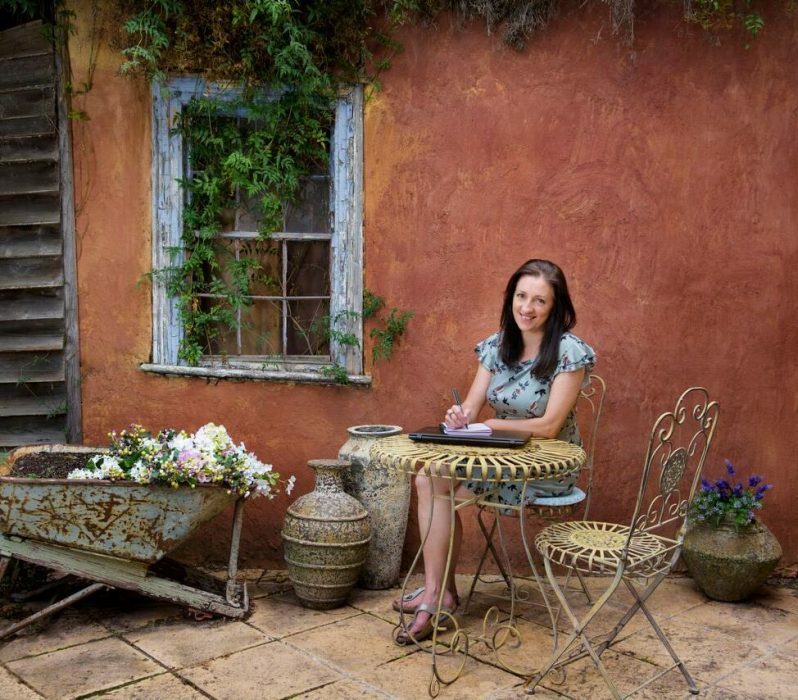 Her passion for travel and the natural world has seen her working as a writer and editor on a number of websites. 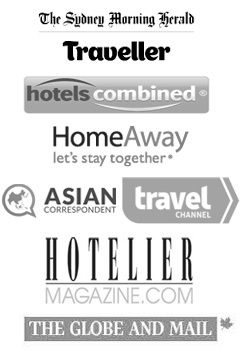 Linda has articles published in magazines and newspapers in Australia and the UK, and has also contributed to the inspirational travel book 1001 Escapes to Make Before You Die. Could this location be more beautiful? It’s brilliant to share the present moment and also to learn some of the sites’ history. I can’t help but feel a connection with your experience here in this stunningly beautiful site that you have visited a thousand times before but now, through more experienced eyes, see in far greater depth. Such experiences may be both some of the most wonderfully profound and subtly painful that we experience as we grow older. Thank you for sharing yours. D’you know, Derek, must fess up, meant to use ‘fortress of solitude’ in the title, but got my Bond and Superman mixed up! And here’s me thinking I’m a Sci/fi/fantasy buff! Thought I’d leave it as is though, because I’m thinking Fortress of Solace suits Grianan so much more. There looks to be lovely views from this fortress. Hey Jennifer, they really are amazing. Unfortunately, it’s hard to read distances from photos so you can’t really appreciate how far you can see from the top. It’s easy to spend a few hours just sitting there… when it’s not freezing! I completely ‘get’ that feeling Linda, and I agree it’s often so hard to come by when you move around the world so much. It looks such a beautiful spot, and so infused with history and old energy that I can understand your rootedness to the fort when you visited. It’s funny the places that can induce pangs of intense homesickness, and often they are not the most familiar places. I don’t know at what stage you begin to feel a connection with a place; I can live in a town/village/country for a few years and not really connect, but another place I might develop an umbilical chord connection much more quickly and for what reasons, I can’t quite decipher. Thanks for your comment, Jo. And sorry it took so long to publish. Was in a bit of a hiatus there. Been enjoying being back in my Aussie home. Spending time with the girls and their daddy all together again after three long months apart! Although I love the connections I have back in Europe, I must admit, I’m very lucky to have such wonderful – different – connections here in Oz.